Romelu Lukaku continued to wage his personal crusade against West Ham, scoring on his seventh successive appearance against the Hammers on a muggy, wet afternoon at a subdued Upton Park. Otherwise this was a low-pressure meeting of two neat, quick-passing teams, illuminated by some nice touches but little in the way of unbound attacking play. When counterattack meets counterattack the result can often be a little lukewarm. By the end a 1-1 draw was fair enough in a game marked out by two delightful first-half goals, the first a dreamy finish by Manuel Lanzini, the second from Lukaku made by an outstanding through pass by Gerard Deulofeu. If there was little in the way of sustained pressure from the home team, Slaven Bilic was happy enough afterwards with a point before the international break, less happy with the injuries suffered by Dimitri Payet and Enner Valencia. Payet never recovered from a heavy scissors tackle in the first half from James McCarthy, a shame as the Frenchman had started brightly, one early thrust down the right teeing up Victor Moses for a shot that crept wide. Payet also provided the moment of a cagey first quarter with a slick drag-back nutmeg on Ross Barkley in the centre circle that had half the stadium breaking out in a kind of delighted giggle. Everton had come here slightly unnerved by the openness of their 6-2 victory against Sunderland � �We put a lot of emphasis on wanting to be solid after our performance last week,� Martínez admitted � and it showed as both teams settled into a pattern of cautious thrust and counter-thrust. 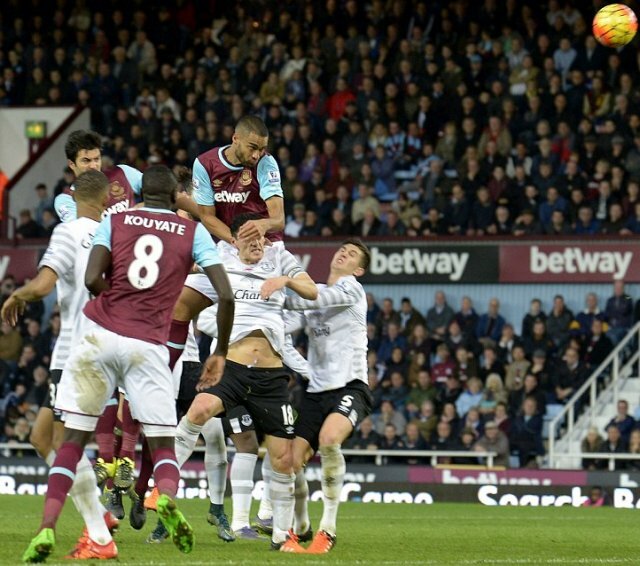 It took a moment of off-the-cuff brilliance from Lanzini on the half-hour to open the scoring. Moses drove into the box and shot hard and low. The ball was blocked and finally cleared by Stones to Lanzini 30 yards out. The Argentinian tiptoed forward, shifted the ball between his feet and curled a sensational finish up and over Tim Howard into the top corner. A 1-0 lead rarely brings the kind of full team bundle West Ham�s players staged near the corner flag in celebration. But this was a genuinely outstanding piece of skill, imaginatively conceived and brilliantly executed, the ball seeming to hang, then dip, before finding a spot Howard just couldn�t reach. The goal did little to change the cagey pattern of the game. Like West Ham�s goal, Everton�s equaliser two minutes before half-time came from nowhere, the product of a moment of off-the-cuff brilliance from Deulofeu. Payet lost the ball trying to slalom past McCarthy. Deulofeu picked it up and slid a gorgeous pass through the tiniest channel, perfectly weighted for Lukaku to take the ball around Adrián and finish. It would be hard to blame Payet. The pass to make the goal was instant perfection, the West Ham defence filleted a little too easily. Plus, of course, Lukaku is the hammer of the Hammers, and scorer now of five goals in his last six Premier League games. Four minutes into the second half Payet went off, Valencia taking his place and then leaving on a stretcher 20 minutes later having injured both ankles in quick succession. �The first was a bad challenge,� Bilic mused. �The second was � English�. West Ham continued to make what running there was, but a draw was a fair enough result in a match between two teams who were never that interested in committing players forward in search of a win. Everton will still harbour some genuine thoughts from here of making a play for that suddenly rather available fourth place. They have a high-class first XI, no midweek European distractions and a manager who bristles with ambition. Albeit not so much here, where a little more sustained attacking intent might have made all the difference.